"Ansuz" redirects here. For the runic character, see Ansuz (rune). In Old Norse, ǫ́ss (or áss, ás, plural æsir; feminine ásynja, plural ásynjur) is a member of the principal pantheon in Norse religion. This pantheon includes Odin, Frigg, Thor, Baldr and Týr. The second pantheon is known as the Vanir. In Norse mythology, the two pantheons wage war against each other, which results in a unified pantheon. The cognate term in Old English is ōs (plural ēse) denoting a deity in Anglo-Saxon paganism. The Old High German is ans, plural ensî. The Gothic language had ans- (based only on Jordanes who glossed anses with uncertain meaning, possibly 'demi-god' and presumably a Latinized form of actual plural *anseis). The reconstructed Proto-Germanic form is *ansuz (plural *ansiwiz). The ansuz rune, ᚫ, was named after the Æsir. Unlike the Old English word god (and Old Norse goð), the term ōs (áss) was never adopted into Christian use. Æsir is the plural of áss, óss "god" (genitive case āsir), which is attested in other Germanic languages, e.g., Old English ōs (gen. pl. ēsa), Old Dutch ans and Gothic (as reported by Jordanes, who wrote in the 6th century CE) anses "half-gods". These all stem from Proto-Germanic *ansuz, which itself comes from Proto-Indo-European *h₂énsus (gen. h₂n̥sóus) "life force" (cf. Avestan aŋhū "lord; lifetime", ahura "godhood", Sanskrit ásu "life force", ásura "demons" ( *h₂n̥suró). It is widely accepted that this word is further related to *h₂ens- "to engender" (cf. Hittite hass- "to procreate, give birth", Tocharian B ās- "to produce"). Old Norse áss has the genitive áss or ásar, the accusative æsi and ásu. In genitival compounds, it takes the form ása-, e.g. in Ása-Þórr ("Thor of the Æsir"), besides ás- found in ás-brú "gods' bridge" (the rainbow), ás-garðr, ás-kunnigr "gods' kin", ás-liðar "gods' leader", ás-mogin "gods' might" (especially of Thor), ás-móðr "divine wrath" etc. Landâs "national god" (patrium numen) is a title of Thor, as is allmáttki ás "almighty god", while it is Odin who is "the" ás. The feminine suffix -ynja is known from a few other nouns denoting female animals, such as apynja "female monkey", vargynja "she-wolf". The word for "goddess" is not attested outside Old Norse. The latinization of Danish Aslak as Ansleicus, the name of a Danish Viking converted to Christianity in 864 according to the Miracles de St. Riquier, indicates that the nasalization in the first syllable persisted into the 9th century. The cognate Old English form to áss is ōs, preserved only as a prefix Ōs- in personal names (e.g. Oscar, Osborne, Oswald) and some place-names, and as the genitive plural ēsa (ēsa gescot and ylfa gescot, "the shots of anses and of elves", i.e. "elfshot", jaculum divorum et geniorum). In Old High German, Old Dutch and Old Saxon, the word is only attested in personal and place names, e.g. Ansebert, Anselm, Ansfrid, Vihans. Jordanes has anses for the gods of the Goths. The interaction between the Æsir and the Vanir has provoked an amount of scholarly theory and speculation. While other cultures have had "elder" and "younger" families of gods, as with the Titans versus the Olympians of ancient Greece, the Æsir and Vanir were portrayed as contemporaries. The two clans of gods fought battles, concluded treaties, and exchanged hostages (Freyr and Freyja are mentioned as hostages). An áss like Ullr is almost unknown in the myths, but his name is seen in a lot of geographical names, especially in Sweden, and may also appear on the 3rd century Thorsberg chape, suggesting that his cult was widespread in prehistoric times. The names of the first three Æsir in Norse mythology, Vili, Vé and Odin all refer to spiritual or mental state, vili to conscious will or desire, vé to the sacred or numinous and óðr to the manic or ecstatic. A second clan of gods, the Vanir, is also mentioned in Norse mythology: the god Njörðr and his children, Freyr and Freyja, are the most prominent Vanir gods who join the Æsir as hostages after a war between Æsir and Vanir. The Vanir appear to have mainly been connected with cultivation and fertility and the Æsir were connected with power and war. In the Eddas, however, the word Æsir is used for gods in general, while Asynjur is used for the goddesses in general. For example, in the poem Skírnismál, Freyr was called "Prince of the Æsir". In the Prose Edda, Njörðr was introduced as "the third among the Æsir", and among the Asynjur, Freyja is always listed second only to Frigg. In surviving tales, the origins of many of the Æsir are unexplained. Originally, there are just three: Odin and his brothers Vili and Vé. Odin's sons by giantesses are naturally counted as Æsir. 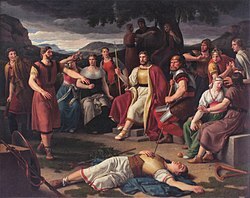 Heimdallr and Ullr's connection with the Æsir is not clearly mentioned. Loki is a jötunn, and Njörðr is a Vanir hostage, but they are often ranked among the Æsir. Given the difference between their roles and emphases, some scholars have speculated that the interactions between the Æsir and the Vanir reflect the types of interaction that were occurring between social classes (or clans) within Norse society at the time. According to another theory, the Vanir (and the fertility cult associated with them) may be more archaic than that of the more warlike Æsir, such that the mythical war may mirror a half-remembered religious conflict. This argument was first suggested by Wilhelm Mannhardt in 1877 (as described in Dumézil, xxiii and Munch, 288). On a similar note, Marija Gimbutas argues that the Æsir and the Vanir represent the displacement of an indigenous Indo-European group by a tribe of warlike invaders as part of her Kurgan hypothesis. See her case in The Living Goddess for more details. Another historical theory is that the inter-pantheon interaction may be an apotheosisation of the conflict between the Roman Kingdom and the Sabines. Finally, the noted comparative religion scholar Mircea Eliade speculated that this conflict is actually a later version of an Indo-European myth concerning the conflict between and eventual integration of a pantheon of sky/warrior/ruler gods and a pantheon of earth/economics/fertility gods, with no strict historical antecedents. (21.) Thor is the foremost of them. He is called Asa-Thor, or Oku-Thor. He is the strongest of all gods and men, and rules over the realm which is called Þrúðvangr. (23.) the third asa is he who is called Njörðr. (25.) There is yet an asa, whose name is Týr. He is very daring and stout-hearted. He sways victory in war, wherefore warriors should call on him. (26.) Bragi is the name of another of the asas. He is famous for his wisdom, eloquence and flowing speech. (27.) Heimdallr is the name of one. He is also called the white-asa. He is great and holy; born of nine maidens, all of whom were sisters. He is also called Hallinskide and Gullintanne, for his teeth were of gold. (28.) Höðr hight one of the asas, who is blind, but exceedingly strong; and the gods would wish that this asa never needed to be named, for the work of his hand will long be kept in memory both by gods and men. (29.) Víðarr is the name of the silent asa. He has a very thick shoe, and he is the strongest next after Thor. From him the gods have much help in all hard tasks. (30.) Váli, is the son of Odin and Rindr. He is daring in combat, and a good shot. (31.) Ullr is the name of one, who is a son of Sif, and a step-son of Thor. He is so good an archer, and so fast on his skis, that no one can contend with him. He is fair of face, and possesses every quality of a warrior. Men should invoke him in single combat. (33.) There is yet one who is numbered among the asas, but whom some call the backbiter of the asas. He is the originator of deceit, and the disgrace of all gods and men. His name is Loki, or Lopt. ... His wife hight Sigyn, and their son, Nare, or Narfe. Frigg is the first; she possesses the right lordly dwelling which is called Fensaler. The second is Sága, who dwells in Sokvabek, and this is a large dwelling. The third is Eir, who is the best leech. The fourth is Gefjon, who is a may, and those who die maids become her hand-maidens. The fifth is Fulla, who is also a may, she wears her hair flowing and has a golden ribbon about her head; she carries Frigg's chest, takes care of her shoes and knows her secrets. The sixth is Freyja, who is ranked with Frigg. She is wedded to the man whose name is Oder; their daughter's name is Hnos, and she is so fair that all things fair and precious are called, from her name, Hnos. Oder went far away. Freyja weeps for him, but her tears are red gold. Freyja has many names, and the reason therefor is that she changed her name among the various nations to which she came in search of Oder. She is called Mardol, Horn, Gefn, and Syr. She has the necklace Brising, and she is called Vanadis. The seventh is Sjöfn, who is fond of turning men's and women's hearts to love, and it is from her name that love is called Sjafne. The eighth is Lofn, who is kind and good to those who call upon her, and she has permission from Alfather or Frigg to bring together men and women, no matter what difficulties may stand in the way; therefore "love" is so called from her name, and also that which is much loved by men. The ninth is Var. She hears the oaths and troths that men and women plight to each other. Hence such vows are called vars, and she takes vengeance on those who break their promises. The tenth is Vör, who is so wise and searching that nothing can be concealed from her. It is a saying that a woman becomes vor (ware) of what she becomes wise. The eleventh is Syn, who guards the door of the hall, and closes it against those who are not to enter. In trials she guards those suits in which anyone tries to make use of falsehood. Hence is the saying that "syn is set against it," when anyone tries to deny ought. The twelfth is Hlín, who guards those men whom Frigg wants to protect from any danger. Hence is the saying that he hlins who is forewarned. The thirteenth is Snotra, who is wise and courtly. After her, men and women who are wise are called Snotras. Sól and Bil are numbered among the goddesses, but their nature has already been described. ᚬ Óss er algingautr / ok ásgarðs jöfurr, / ok valhallar vísi. / Jupiter oddviti. "Óss is Aged Gautr / and prince of Asgard / and lord of Valhalla / chieftain Jupiter." The name of 𐌰 a in the Gothic alphabet is ahsa. The common Germanic name of the rune may thus have either been ansuz "God, one of the Æsir", or ahsam "ear (of corn)"
The personal names Old Norse Ásleikr (Latinised as Ansleicus), Old English Óslác (modern "Hasluck") and Old High German Ansleh may continue the term for a sacrificial performance for the gods in early Germanic paganism (*ansu-laikom). Grimm's Deutsches Wörterbuch (s.v. "Leich") compares *laikom to the meaning of Greek χορος, denoting first the ceremonial procession to the sacrifice, but also ritual dance and hymns pertaining to religious ritual. Paul Herrman (1906) identified as such *ansulaikom the victory songs of the Batavi after defeating Quintus Petillius Cerialis in the Revolt of the Batavi in the year AD 69 according to Tacitus' account, and also the "nefarious song" accompanied by "running in a circle" around the head of a decapitated goat sacrificed to (he presumes) Wodan (Odin), sung by the Lombards at their victory celebration in 579 according to the report of Pope Gregory I (Dialogues ch. 28). Gothic has Ansila and Ansemund. Theophoric names of the Anglo-Saxons containing the os element: Osmund, Osburh, Oslac, Oswald, Oswiu, Oswin(e), Osbert, Oswudu, Osred, Oslaf, Øsa (with i-mutation from a presumed *ós-i-), Osgar (Anglo-Saxon form of Ásgeir). These names were notably popular in the dynasty of Bernicia. Still current are the surnames Osgood and Osborn. As occurs in many Scandinavian given names: Asbjørn, Asgeir (Asger, Asker), Asmund, Astrid, Asdîs, Asgautr, Aslaug, Åse, etc. Old High German had Anso, Anselm, Ansgar, Anshilt, Anspald, and Ansnôt, and Lombardic has Answald and Ansprand. As also occurs in some English names. In 874, King Asketil was one of four Viking nobles who sacked Repton, the capital of Mercia, England. As 'ketil' means 'cauldron' (whence the English word 'kettle' is derived), his name means 'God's cauldron'. The English surname Astle is derived from his name; however, it is not related to the name Astley. Less common alternative spellings of Astle include Astel, Astell, Astill, Astyll and Astull. Ásatrú, a kind of Heathenry whose name means "faith in the Æsir", is a new religious movement of polytheistic reconstructionism based on Norse paganism. As of 2007, Ásatrú is a religion officially recognized by the governments of Iceland, Norway, Denmark,[not in citation given] and Sweden. In spite of the literal meaning of Ásatrú, most adherents do not emphasize worship of the Æsir in particular. The Icelandic Ásatrúarfélagið describes Ásatrú as "Nordic pantheism" involving "belief in the Icelandic/Nordic folklore" including all the "spirits and entities" besides "gods and other beings" this entails. ^ "Aesir | Scandinavian mythology". Encyclopedia Britannica. Retrieved 2017-08-28. ^ Adams, Douglas Q. (1997). Encyclopedia of Indo-European Culture. Taylor & Francis. p. 330. ISBN 978-1-884964-98-5. ^ Incorporated, Facts On File (2009). Norse Mythology A to Z. Infobase Publishing. ISBN 9781438128016. ^ Dumézil, 3-4, 18; Turville-Petre, 159-162. ^ Turville-Petre, 161. See especially ff. 37. ^ See this pattern discussed in Eliade's Patterns in Comparative Religion - Section II (30) - The Supplanting of Sky Gods by Fecundators. New York: Sheed & Ward, 1958. Supporting this position, Turville-Petre notes, "In one civilization, and at one time, the specialized gods of fertility might predominate, and in another the warrior or the god-king. The highest god owes his position to those who worship him, and if they are farmers, he will be a god of fertility, or one of the Vanir" (162). ^ Odinsson, Eoghan (2010). Northern Lore: A Field Guide to the Northern Mind-Body-Spirit. pp. 195–96. Retrieved 20 February 2019. ^ Herrmann, Paul (1908). Nordische Mythologie in gemeinverständlicher Darstellung. Engelmann. p. 342. ^ Herrmann, Paul (1928). Altdeutsche Kultgebräuche. E. Diederichs. ^ "Kirkeministeriet". Archived from the original on 2007-02-09. Retrieved 2007-02-09. Munch, P. A. (1926). Norse Mythology: Legends of Gods and Heroes. In the revision of Magnus Olsen; translated from the Norwegian by Sigurd Bernhard Hustvedt. New York: The American-Scandinavian Foundation; London: H. Milford, Oxford University Press. Look up ásynja in Wiktionary, the free dictionary. Look up áss in Wiktionary, the free dictionary.